Lots of stuff to do today and a forecast for rain starting at around noon (or later for the other forecast). So we are up at 4:30 and underway by 6:00 (not particularly early by our standards, but for the others in the group it's an early start). This time we are going up to Taatsukajik peak (800m), directly above camp, so the approach is nice and short. It's about an hour from camp to the foot of the snowfield that we'll follow up. 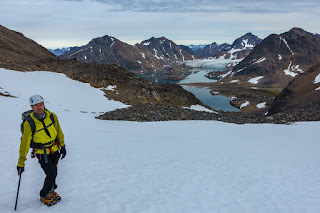 On with the crampons, out with the ice axes and then we start the climb up the snow. Conditions are great. 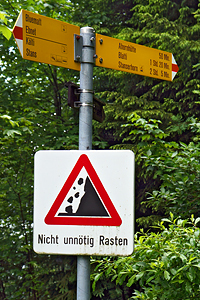 It's initially not terribly steep, so it's easy to get into the rhythm. Towards the top of the first bit it steepens up and we switch to using one crampon flat and one toe-in - John calls this "American technique" - it's quite effective. Nicely stable and with good snow, greg's heart rate stays reasonably low. From the top of this first steep stretch we plan the mixed bit to the col above us. This starts off on snow and then transitions to loose rock (crampons off!) which leads us without too many problems to the saddle and its views. From here we follow the very lovely ridge directly to the peak. Amazing views from here! 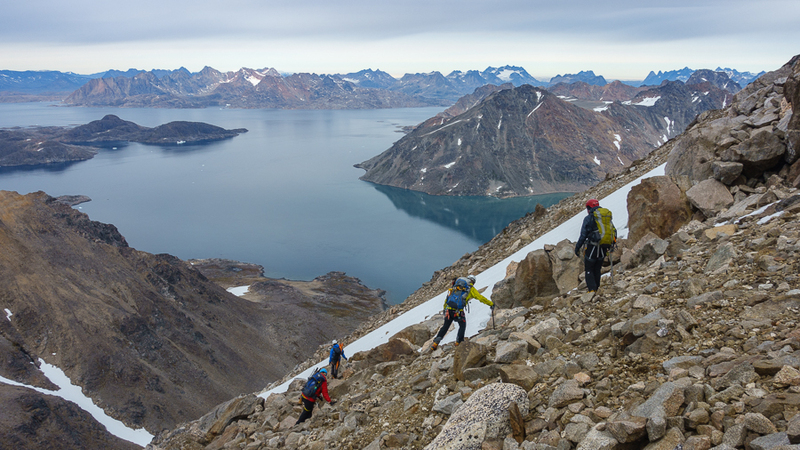 After a very short rest, view, photo, and snack break we turn back and descend along more or less the same route. The snowfield is a bit scary for greg, but after watching the plunge step technique and following John things aren't too bad. It starts to rain lightly for a bit on the way down. Joy! Back at camp we break down the tents and pack everything up as quickly as possible and then start the long, slow process of carrying everything back to the pick up point. It rains on and off, at times hard, throughout this process. By the time the boat arrives at 15:00 we are bundled up and ready to go. 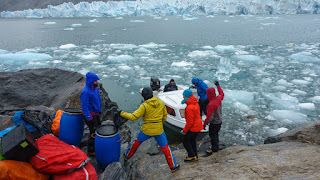 The boat ride north, which is cold but fortunately not very wet, is really spectacular. Past glaciers and peaks and islands and icebergs and and and! 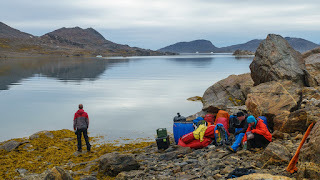 by the time we pull into the the inlet (Sermiligaaq Fjord?) 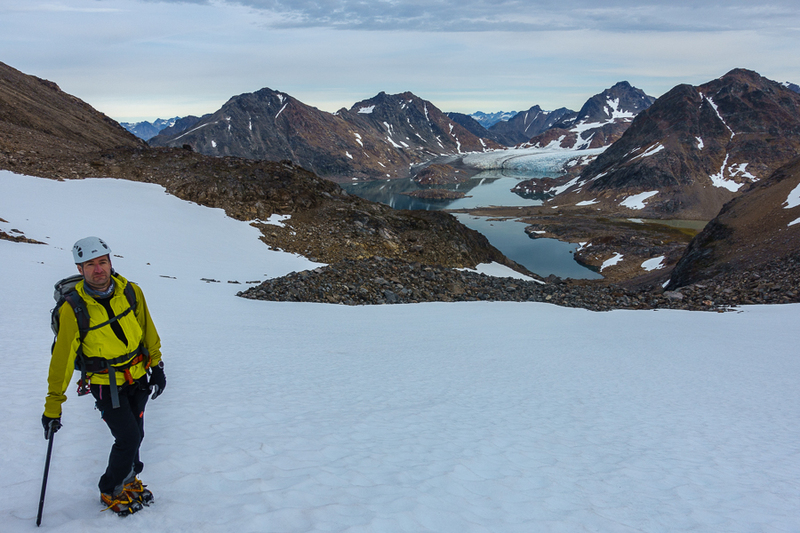 with the big glacier at the end (Apuseeq / Knud Rasmussen Gletscher) we are very cold, but still awed by the scenery. 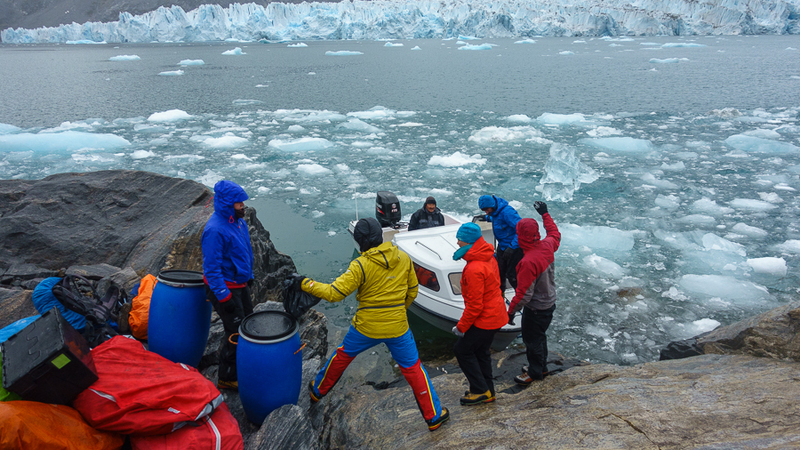 Lars pulls to a group of big boulders on the shore, uses the boat to push aside a bunch of blocks of ice, and we unload our stuff onto the rocks on shore. Here it's a short walk up to the campsite (yay!). Since it's currently not raining (yay! 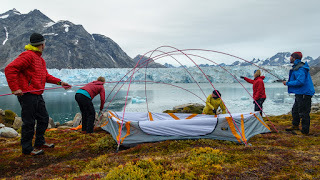 ), we quickly get the tents up, pitch the cooking tent and then have something warm to drink along with a snack before dinner. Dinner is chicken korma (again odd with texture but ok in taste). We hang out for a bit after dinner and then head off to bed.